This module allows each user in your DotNetNuke portal the ability to create their own folders and structure and to upload files. 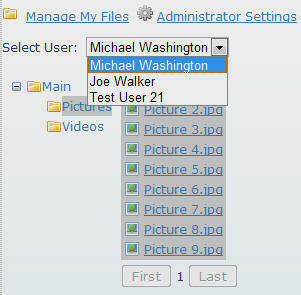 You can allow only the users in a specified role the ability to upload files. The files that the users upload are displayed on the main screen to allow any user who has access to the module to browse and download. When you install the module, and you are logged in as a administrator, you will see the Administrator Settings link. This takes you to the screen that allows you to set the Upload Role (the role that will see the "Manage My Files" link and will be allowed to create folders and upload files). It will also allow you to set the upload folder. This is a "rolling repository", if files are uploaded to one path and the path is changed for future files, the application will remember what location each file was uploaded to and will be able to retrieve all files. This will allow you to specify different directories at different times. The reason it is desirable to use a Silverlight file manager over a HTML one is that the user is more productive when they are able to drag and drop. Compare this version of the DotNetNuke File Manager to the previous version, and you will see that the Silverlight interface provides a cleaner more intuitive interface. In addition, it allows users to perform file management functions with fewer keystrokes and in less time. This module also demonstrates that the old restrictions on client uploads no longer applies. It is now possible to create applications that allow your users to upload large files. This opens up a wide range of solutions that were previously not possible.